So your 40" toddler's off the magic carpet. Bravo. (OK, so she's 42" tall in her ski boots with the helmet.) That means the family can finally ski the bunny slope together! So, um, what's worrying you? I can see you eyeing that big, tall, long, incredibly fast new high-speed quad lift they've just installed on the bunny slope at your local ski area. Yep, times have changed since we graduated from those glove-eating rope tows to spend our entire childhoods skiing from wimpy two-man chairlifts. 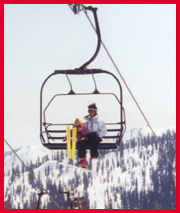 Since beginning skiing has gone big-time, it's time for a chair lift safety refresher course. Ever wondered how to properly and safely load your kids on and off the chair lift the way seasoned instructors do? I asked the experts at Beaver Creek's award-winning Ski and Snowboard School. Greg Willis, director of the children's ski school, turned me over to Andrea Soborowski. Bubbling with enthusiasm, Soborowski is a long-time instructor who now runs the StarRider program at Beaver Creek. While signing me in and fitting me into a cool StarRider jacket, Andrea reminded me that children under the age of seven are not allowed to ride lifts at Vail or Beaver Creek without an adult. Since most group lessons number about four kids to one instructor, the StarRider program recruits responsible, safety-conscious, reliable (and very fun) adults to assist instructors by riding the beginner lifts with young children. After qualifying then completing Soborowski's intensive procedures and safety course, StarRiders earn free season dual-resort ski passes in return for serving 25 to 30 shifts a year. Volunteers with less time can rack up two comps for every day they serve: one free ski ticket on the day they work, and one transferable comp to take home afterwards. "Yeah, that's a cool benefit," one StarRider told me while we were waiting for an assignment, "but it's really all about the kids. The most important thing we do as StarRiders is give the kids more runs every day." As you enter the maze, look ahead. Position yourself on the hut side of the chair with the child on the inside, towards the drive station. Even with the new speed reducers, all chair lifts swing around faster on the outside than on the inside. It's your job to give the beginner more time to load. Slide onto the "Wait Here" line and prepare the child for the shuffle to the "Load Here" line. Encourage, but let the child get there under his or her own power. It's your job to stabilize and assist the little skier. Wrap your inside arm over the child's shoulder and across the back, placing your hand firmly under the armpit. Reach across with your outside hand and take the skier's outside hand as you shuffle together. Always be ready to lift the skier (with your inside arm already in place) onto the chair if necessary. Make sure little skiers wiggle their bottoms all the way back against the backrest. Keep them facing forward; NEVER let them turn around on the chairlift. Lower the bar as soon as possible. Keep your arm draped behind the skier's back. Expect kids to hold onto the bar with both hands, and discourage them from kicking their skis together to remove snow. Beginners' DIN settings are very light, and bindings can easily release midair with disastrous results for skiers below the lift. Engage the beginner in light banter and funny conversation and keep talking. Tell jokes. Ask questions. It's common for kids to become withdrawn, fearful and even teary on chairlifts. It's your job to stay breezy and positive all the way to the top. Aim for your stopping point (whether straight ahead, to the right or to the left) and remind the child to keep skis parallel ("French fries"), not to make a wedge ("pizza") when getting off the lift. Your unloading procedure is the exact reverse of how you loaded. Don't raise the bar until your inside hand is beneath the child's armpit, grab the outside hand, lift the skier onto the snow if possible and steady him or her as you both ski away from the drive station. For more on Beaver Creek's Ski School see their website: BeaverCreek.Snow.com . ......Suzanne Stroh ... A veteran StarRider to her four-year-old daughter, Suzanne Stroh is a Washington, D.C. based writer, skier and mountaineer who has made high mountains her second home for the past 10 years. Stroh and her daughter hit the slopes as much as possible.